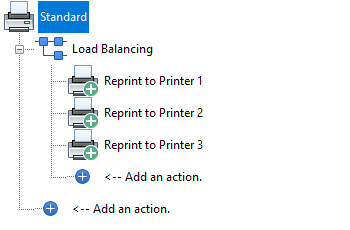 Load balancing or printer pooling lets you spread your print load evenly over a group of printers automatically. Your users will print to a single printer then Print Distributor will send the documents to each printer in the pool in turn. Pausing a printer in the pool or an error status on the printer will cause it to be skipped automatically, as soon as it is released or the error resolved it will rejoin the pool automatically. There is no limit to the number of printers in the pool, add as many as you need. Virtual printers provide a flexible mechanism for controlling your printed output with Print Distributor. They look like a normal Windows printer to your users and the software you print from, their operation is completely transparent. What's really smart about them is instead of just sending your prints directly to a printer they can route jobs to many printers, balance jobs across a group of printers, print to file and even add conditions to print jobs. 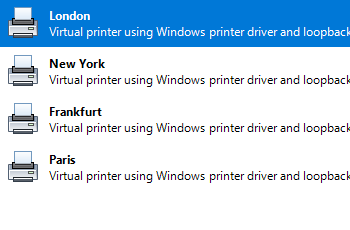 A virtual printer can be shared just like a normal printer, this allows you to install Print Distributor on a server and connect to that server from workstations. 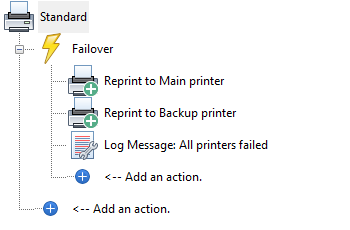 Failover is useful when you want to target one main printer but need a fallback if that printer is out of action for some reason. Print Distributor will start always start with the first printer and if that is unavailable go on to the next and so on until it finds one that is available. Any action can be added to the failover list, not just printers. If you are using the Send Mail action to send email and your mail server goes down then you can redirect to a backup. The same applies to writing files across the network, in the event of a failure Print Distributor can write to a local path instead. 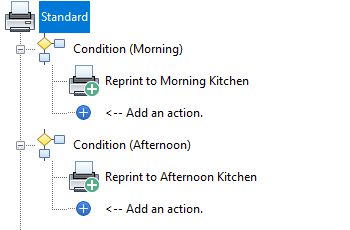 Use conditions to set rules on what prints and where it prints. You might want to discard certain documents or route the documents from a group of users to a specific printer. You can also query attributes of the document itself such as whether it is a double side print or is set to use a specific paper tray in your conditions. Print Distributors flexible configuration lets you setup as many actions as you need for each virtual printer. Need to print and email documents, just add reprint and send mail actions. 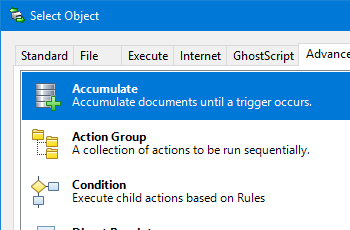 Actions are run one after another top down so you can control and rely on the order, if you have a complex application then they can be grouped to make them easier to manage. Each action is easy to configure but flexible, you can expect to have Print Distributor setup and running in minutes. There are many actions included in Print Distributor. If there is something you need but we don't have then we can provide additional custom actions for your specific requirements, contact us for more information on this.